Showing results for tags 'm cars'. The BMW M Division has developed an exclusive special edition of the world’s most successful high-performance business sedan, setting yet another highlight in the current BMW M5 model range. With power output increased to 441 kW/600 hp and a maximum torque of 700 Newton metres, the BMW M5 “Competition Edition” ranks among the most powerful automobiles in the model history of the BMW brand (combined fuel consumption: 9.9 l/100 km; combined CO2 emissions: 231 g/km)*. The BMW M5 “Competition Edition”, which comes as standard with an M dual clutch transmission featuring Drivelogic, sprints from 0 to 100km/h in just 3.9 seconds. A distinctive personalised look, the standard Competition Package and a comprehensive range of optional features render the BMW M5 “Competition Edition”, the production of which is limited to 200 worldwide, an automobile of exceptionally high value. Munich. The BMW M Division has developed an exclusive special edition of the world’s most successful high-performance business sedan, setting yet another highlight in the current BMW M5 model range. With power output increased to 441 kW/600 hp and a maximum torque of 700 Newton metres, the BMW M5 “Competition Edition” ranks among the most powerful automobiles in the model history of the BMW brand (combined fuel consumption: 9.9 l/100 km; combined CO2 emissions: 231 g/km)*. The BMW M5 “Competition Edition”, which comes as standard with an M dual clutch transmission featuring Drivelogic, sprints from 0 to 100km/h in just 3.9 seconds. A distinctive personalised look, the standard Competition Package and a comprehensive range of optional features render the BMW M5 “Competition Edition”, the production of which is limited to 200, an automobile of exceptionally high value. More power and further enhanced handling characteristics. The familiar 4.4‑litre, high-revving V8 engine featuring path-breaking BMW M TwinPower Turbo technology is the powerful heart of the BMW M5 “Competition Edition”. An increase in boost pressure as well as targeted modifications to the engine management raise the car’s performance vs. the production model by 29 kW/40 hp to 441 kW/600 hp. At the same time, maximum torque has increased by 20 Newton metres to 700 Newton metres. The increase in power output harmonises perfectly with the Competition Package, which is supplied as standard on the BMW M5 “Competition Edition” and noticeably enhances the car’s handling characteristics even further. The Competition Package includes, inter alia, a lowering of the vehicle by 10 millimetres and a firmer setup of spring and damper systems and stabilizers. In conjunction with this modified setup, the specific control setting for the Active M differential fitted as standard on all BMW M5 models ensures further optimized traction. Furthermore, the steering system with an M specific Servotronic function comes with a more direct control map, providing the driver with more precise response and further enhancing the car’s agility in bends. In addition, the M Dynamic Mode of the stability control system DSC (Dynamic Stability Control) has been further aligned to sporty handling characteristics. As a result, the BMW M5 “Competition Edition” guarantees typical M driving dynamics at the highest level both in everyday traffic and on the racetrack, especially when combined with the optional M carbon-ceramic brake system. Exclusive sporty and dynamic look. The BMW M5 “Competition Edition” signalises its extraordinary potential even when at a standstill. The exclusive body colours –100 vehicles in Carbon Black metallic and 100 in Mineral White metallic respectively – strongly emphasise the BMW M5’s sporty, elegant lines. And the 20-inch, forged and polished, double-spoke M light alloy wheels in a Jet Black finish and with mixed tyres (265/35 ZR20 at the front, 295/30 ZR20 at the rear) underscore the car’s outstanding handling characteristics. M Performance parts in carbon such as the rear diffuser, the gurney on the boot lid and the mirror caps set further dynamic accents. The high gloss black kidney grilles and side gills bearing the lettering ”M5 Competition” add the finishing touches to the car's premium appearance. High-quality ambience with sporty accents in the interior. The interior also underscores the uniqueness of the BMW M5 “Competition Edition”. For example, carbon interior trim strips bearing the logo “M5 Competition 1/200” indicate the model’s high-performance qualities and the fact that the BMW M5 “Competition Edition” is just one of the 200 that have been built. The sophisticated interior ambience is strongly characterised by the full leather trim Merino Black with contrast stitching in Opal White and floor mats in Anthracite with leather Merino Opal White bordering. Inside the BMW M5 “Competition Edition”, both driver and front passenger sit in M multifunctional seats, the comprehensive electric adjustment options of which guarantee a perfect balance between comfort and sporty lateral support. Here too, the white lettering “///M5” embroidered on the headrests emphasises the car’s exclusiveness. Further equipment highlights round off the impressive appearance of the ultimate high-performance business sedan: These include the 1,200 watt Bang & Olufsen High End Surround Sound System, BMW Head-Up Display, Comfort Access, Lane Departure Warning or the optional BMW Driving Assistant, heated seats at the front or the through-loading system. The BMW M5 “Competition Edition” is available from 129,500 Euros *Figures based on the EU test cycle, may vary depending on the tyre format specified. The new BMW M5 (fuel consumption combined: 10.5 l/100 km [26.9 mpg imp]*; CO2 emissions combined: 241 g/km*) takes BMW M GmbH into new territory, with M xDrive all-wheel drive featuring in the high-performance sedan for the first time. This change of tack sees the M5 exploring new dynamic dimensions and offering greater everyday practicality in all driving conditions. The new car is committed to building on the tradition of a concept – the luxurious four-door business sedan with a taste for the race track – first glimpsed in 1984 with the original BMW M5. The new M xDrive developed by BMW M GmbH is the most emotionally engaging all-wheel-drive system yet to grace the high-performance segment. It works with a central transfer case with multi-plate clutch and distributes drive fully variably between the front and rear axle, as required. Another ingredient in the car’s supreme traction in all road and weather conditions is the Active M Differential at the rear axle, which also works fully variably and has a locking effect between 0 and 100 per cent. The character of M xDrive can be adjusted as desired. The driver has five different configurations to choose from based on combinations of the DSC modes (DSC on, MDM, DSC off) and M xDrive modes (4WD, 4WD Sport, 2WD). In the basic setting with DSC (Dynamic Stability Control) activated and 4WD, the system permits slight slip through the rear wheels when accelerating out of corners – and therefore plays its part in giving the new BMW M5 its sporting agility. In M Dynamic mode (MDM, 4WD Sport) M xDrive allows easily controlled drifts. The three M xDrive modes with DSC switched off have been conceived to sate the appetites of keen drivers and primarily for use on the track. Here, the driver can choose from three configurations up to and including pure rear-wheel drive (2WD). This mode allows the driver to pick their own drift angle and treats connoisseurs to driving dynamics in their purest form. Providing ample power for the new BMW M5 is a 4.4-litre V8 bi-turbo engine with M TwinPower Turbo technology. The M engineers have carried out significant revisions to the outgoing model’s power unit. For example, newly developed turbochargers, ultra-efficient indirect charge air cooling and increased fuel injection pressure together help to raise output and, above all, torque. The engine develops 441 kW/600 hp at 5,600 – 6,700 rpm, while a monumental 750 Nm (553 lb-ft) of torque is placed at the driver’s disposal from as low down as 1,800 rpm and remains there until 5,600 rpm. A map-controlled, fully variable oil pump ensures oil is supplied as and when the new BMW M5 needs it, even on the track. The car’s impressive performance figures speak for themselves: 0 to 100 km/h (62 mph) in just 3.4 seconds, 0 to 200 km/h in 11.1 seconds (124 mph). Top speed, meanwhile, is an electronically limited 250 km/h (155 mph), but the optional M Driver’s Package can keep the fun coming to 305 km/h (189 mph). The new BMW M5 channels all that power through a specially tuned eight-speed M Steptronic transmission with Drivelogic. In D mode it provides all the comfort and convenience of fully automatic gear changes, but can then also switch to sequential manual shifts. The driver can do this using either the compact selector lever on the centre console or the steering wheel-mounted paddles. Drivelogic allows the driver to adjust the transmission’s characteristics to their personal preferences. For track use, the eight-speed M Steptronic unit serves up lightning-fast shift times, helping to give the new BMW M5 its exceptional agility and dynamic flair. The suspension of the new BMW M5 is likewise designed to deliver both maximum traction for everyday use and supreme dynamic performance on the track. 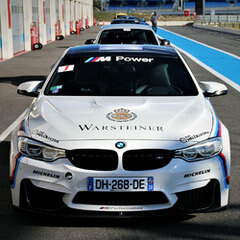 Like the engine, transmission and M xDrive system, it has been tuned by experts and racing drivers at venues including the world’s most exacting test facility – the Nürburgring Nordschleife circuit. Sophisticated stiffening elements in the front and rear structures ensure the body structure is extremely rigid and therefore that the car provides instantaneous feedback, in particular when the driver is pushing hard on the road or track. The driver can also choose from Comfort, Sport and Sport Plus modes for the Variable Damper Control (VDC) system – which has M-specific tuning – and the M Servotronic steering. And the engine’s characteristics can also be configured to the driver’s tastes via the Efficient, Sport and Sport Plus modes. The two M1 and M2 buttons on the M leather steering wheel can be used to store two set-ups combining the driver’s preference of engine, transmission, suspension and M xDrive modes, the DSC mode and Head-Up-Display settings. The driver can then activate their preferred set-up by pressing the relevant button. The new BMW M5 includes revisions to its bodywork over the regular BMW 5 Series to satisfy its challenging dynamic brief. The M engineers have redesigned the broader front side panels and front bumper trim to include larger apertures for the air feeding the cooling systems and brakes. Also new is the rear diffuser. The exhaust system’s quartet of tailpipes are a visual pointer to the power generated by the BMW M5 and also lay on a suitably sporting soundtrack for the job in hand, courtesy of their flap control system. The driver can use a button to adjust the engine sound as desired. The bonnet, which also has an M-specific design, is made from aluminium and boasts eye-catching sculpture lines. These extend into the extremely lightweight carbon fibre-reinforced plastic (CFRP) roof – a standard feature of the new M5. The weight savings contributed by the CFRP roof and other components such as the exhaust system help to ensure the new BMW M5 with M xDrive all-wheel drive is lighter than its predecessor. The new BMW M5 is fitted as standard with M compound brakes, which are lighter than conventional grey cast iron items and therefore also bring down the car’s weight. With blue-painted six-piston fixed callipers at the front and single-piston floating callipers at the rear, plus perforated, inner-vented brake discs all round, the M compound brakes have the speed-shedding power to befit the car’s dynamic potency. The optional M carbon ceramic brakes, which can be identified by callipers painted in a gold colour and shave another 23 kilograms off the M5’s weight, can withstand even greater punishment. The new BMW M5 comes as standard with polished 19-inch light-alloy wheels (front: 9.5 x 19, rear: 10.5 x 19) in Orbit Grey and M-specific tyres (front: 275/40 R 19, rear: 285/40 R 19). 20-inch items can be specified as an option (front: 275/35 R 20 tyres on 9.5 x 20 rims, rear: 285/35 R 20 tyres on 10.5 x 20 rims). Standard specification for the new BMW M5 also features Merino leather and M seats with electric adjustment. The options list includes newly developed M multifunction seats, which stand out with their bucket-seat-style construction and even better lateral support. The new BMW M5 can be ordered from September 2017, priced at €126,500 in France, and deliveries will begin in spring 2018. Scheduled for launch on the same sales start date as the standard M5 is the BMW M5 First Edition. This special-edition version – limited to a run of 400 examples worldwide – has BMW Individual Frozen Dark Red Metallic paintwork. Its price for the French market is to be announced at a later stage. Further information on official fuel consumption figures, specific CO2 emission values and the electric power consumption of new passenger cars is included in the following guideline: “Leitfaden über Kraftstoffverbrauch, die CO2-Emissionen und den Stromverbrauch neuer Personenkraftwagen” (Guideline for fuel consumption, CO2 emissions and electric power consumption of new passenger cars), which can be obtained from all dealerships, from Deutsche Automobil Treuhand GmbH (DAT), Hellmuth-Hirth-Str. 1, 73760 Ostfildern-Scharnhausen and at http://www.dat.de/en/offers/publications/guideline-for-fuel-consumption.html. * Fuel consumption and CO2 emissions figures are provisional, based on the EU test cycle and may vary depending on the tyre format specified.